Can Telco’s compete in the OTT Reality? As broadband has become ubiquitous to our lives, consumers have changed their behaviors as well as their expectations when it comes to communication needs and content availability. Today users expect to communicate using the most convenient mechanism at any point in time, where convenience could be based on price, usability or uniqueness of features offered. In addition, smart phones and the decoupling of applications from connectivity have also led to a paradigm shift where application providers can easily reach to millions or hundred of millions of users in no-time, providing a scale and a cost structure outpacing traditional telecom operators. Telco’s are today caught in the middle with existing business models to defend, large revenues at stake and often a lack of capabilities or scale to innovate at the same pace as OTT players. Disruptions in the value chain have led to many changes and more to come. Regulation is becoming less strong (think net-neutrality), Operator portals are being replaced by android and apple application stores and users expect communication and even most of the content to be free. Where does this leave today’s Telco’s? Having a closer look at the last point, you might see that there is nothing like a free lunch. An OTT that offers free services has a plan to monetize these in one way or the other. The reason could be because they actually want to sell more devices, harvest the knowledge from the community or monetize from advertising, there is always a hidden or less hidden agenda. The first point to tackle for operators, when reviewing today’s value chain, is to change from a voice centric to a data centric business model. By doing this, operators can package their services in a much more integrated way and give the perception that some of the services like voice and SMS are pretty much free as part your broadband subscription. Operators like ATT, Verizon or even Telenor and Telia have moved in this direction over the last couple of years. The second point to recognize is that most users have multiple devices and use multiple services. Each service and each device that is not integrated in the operators offering provides a substantial risk to increase churn in the operator services. Here we are talking about Apps like Whatsapp or Viber, which are providing almost free messaging and free voice services to all its members. But users are not that loyal and most of them might not really care about the application if the tradeoff between price, features and usability is convenient enough. Operators start to realize this and start to provide communication services that integrate voice, video, messaging and content sharing. Beyond the services they also allow you to integrate multiple devices in that equation by providing a unique ID (your mobile ID), have parallel ringing between devices and transfer ongoing calls from device to the other. Rogers in Canada is one of the pioneers in this area, they launched a service called OneNumber which allowed them to reduce churn and even move part of their pre-paid subscribers over to postpaid subscriptions. While moving to a data centric business model and integrating more of the communication offerings will fight churn and price erosion, most operator are though still suffering from a chronic lack of innovation. Part of the strategy could be to partner with OTT’s in selected areas, so that they don’t cannibalize on the operator’s existing revenues but still add value. One example here is the Telia Spotify partnership, where the Operator, Telia and the OTT, Spotify are sharing revenues for a music streaming service that is offered as an add-on to existing Telia mobile broadband subscribers. Operator’s attempting to partner with OTT’s where value propositions overlap had less success, here I am primarily thinking about the attempts to partner with the likes of Skype, but even that might change. Another way to address these challenges is to look at providing voice and other services more efficiently. The emergence of cloud solutions has lead operators to start shifting some of their services to a centrally hosted private cloud. Operators, and furthermore large groups likes Vodafone might even start offering key communication services as a cloud offering to other operators when regulations permit. We have seen Vodafone for instance starting trialing Cloud-based Rich Communication Suite (RCS/Joyn) services with other operators. Last but not least all this connectivity is opening for a massive opportunity to build a truly connected society and that means expanding operators reach beyond people and building new value as part of the internet of things. The key question in the M2M value chain is to see whether operators will be a able to move beyond providing connectivity services. Traditional operator’s sales channels are often not made to target the specific efficiency needs of enterprise that could be addressed by M2M. Key success factor for operators will be the ability to expose some of their strategic assets like connectivity and QOS guaranties, communication capabilities, location services and analytics to take an increasing role in the M2M value chain. 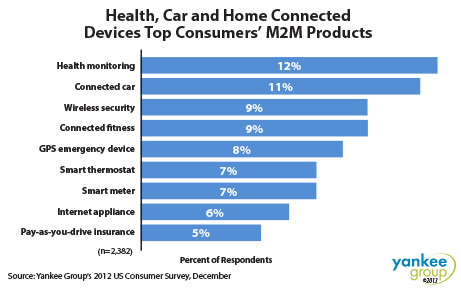 When going through the major vertical Applications for M2M, like healthcare or Connect car there is a business opportunity for operators to provide communication capabilities, location and analytics as a service to enrich these vertical applications and take a stronger position in the M2M value chain. … and finally act, act now! Operators need to act: they need to reach beyond usual services to stay relevant in the communications business and they need to reach beyond people to grow their revenues.